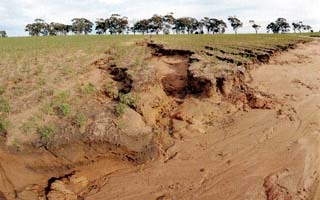 Sheet erosion is the planar removal of surface soil by the action of either raindrop splash, shallow flows of surface of water, or even by wind. Rill erosion is usually linked with sheet (water driven) erosion as the shallow flows of water driving sheet erosion tend to coalesce and thus increase both in velocity and scouring capacity. Sheet and rill erosion by definition removes the topsoil, the most productive asset of farms and the land. As a consequence plant growth is reduced and sustainability compromised. Transported materials are often high in nutrients and fine particles. They damage down-slope sites through turbidity, sedimentation and eutrophication. The primary requirement to avoid sheet erosion is to build and maintain vegetative cover of the soil and ensure the maintenance of high infiltration rates into the soil profile.